Lemon pepper sounds nice! I love any cost saving where I don;t compromise on the quantity and as you know I take food quite seriously! I love spices, especially the Indian curry ones. I get mine from Spices of India, (online). 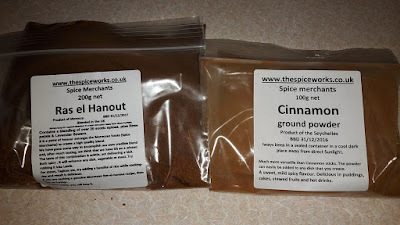 I looked up your cinnamon on there, it's £1.15 for 100g. They do loads of stuff, not just indian, and you can get all sorts of Indian pots and pans etc. on there too. I keep my curry spices in an old biscuit tin and it smells so wonderful when you open it. A really good site I use, if you like a good takeaway type curry, is http://www.curry-recipes.co.uk/curry/index.php where they give recipes on how to make all sorts of British Indian Restaurant curries (rather than authentic Indian ones), eg chicken Korma etc. as well as some Thai and others. Thanks for the link, I'll be trying some of those that's for sure! Early on when me wife and I first moved in together we used to the shopping together (bad idea) I used to spend all my time down the spice isle just reading the labels! Thanks for the info Kev. I get all my spices and seasonings online now, mostly from Spices of India the same as Sue G does. I'll have to check that one out as well by the sounds of it! My favourite must be ground cumin, but we use a lot of raz el hanout too. Like Dawn, I also love smoked paprika. ground cumin is th emain base to my peach and chickpea curry that's one of my staples so we get through quite a bit of that as well! NNNOOOO! Don;t say that. So many meals can be made amazing by the addition of spices! We find it difficult to get fresh spices. Recently we found some Asian food shops in Tralee in Kerry and their spices are brilliant. Once asked my wife to tell the local kebab house where we lived in Blighty to spice up my 'hot' Doner kebab. They duly obliged and I nearly had an heart attack. I think there was steam coming out of the top of my head for twenty minutes. Always be afraid of anything in a curry house ot the like when you say you want it hot, their idea and ours are quite different! We have a drawer next to the cooker, it's full of spices and smells wonderful each time we open it. I love that smell of all the spices mixed together wafting out! smoked paprika for many pork dishes. Cayenne and paprika (thyme also) to make breadcrumbs for chicken (think KFC). cinnamon for cake but also... shhh... add it to lamb dishes. (hangs head in shame) I feel like I have just told you all of our families secret recipes. Shame I havent eaten meat in months. I had always heard that you should buy all your spices in ethnic stores. They are much cheaper and fresher. We don't use any Indian spices because Indian food is not a big thing in homes here, unlike the u.k. We have Indian restaurants but I don't know anyone that cooks it themselves, other than butter chicken!! We go through a lot of Italian spices, paprika, old bay. I'd be lost if I couldn't cook a curry once a week. I struggle with what to cook each night and I love a good curry once a week. my spice cabinet might explode. i really need to clean it out. 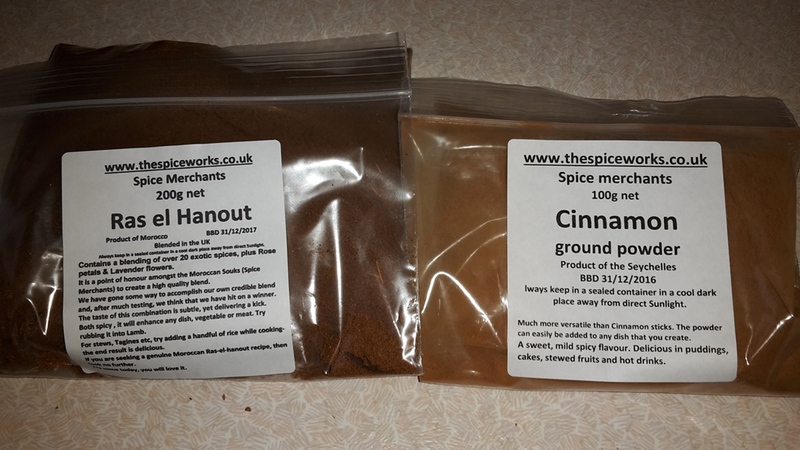 i use ras el hanout often, i love that stuff. i buy most of my spices at bulk places. I need to add to my cupboard. I've just gained some more storage so I'll be buying in bulk now! Plenty to last a long while in my nice cool storage space. I am lucky enough to live in a very diverse neighborhood in Southern California in the US and am able to buy bags of spices to refill my spice jars. I use so much cumin (powder and seeds) and I have fallen in love with Garam Masala...it works in sweet and savory foods. I also love smoked paprika, thyme, oregano and basil and dill. I have also tried to use more turmeric as I hear it is very healthful. Most of spice bags cost me between $1.20 to $3.50 at the ethnic markets. Not tried Garam Masala in a sweet dish, sounds interesting. I bet it would make some good cookies. Curry powder is also high on my list and we like a Thai curry paste although I'd love to make my own in bulk and freeze it. We are lucky enough to be able to buy bulk spices in our organic co-op which is what I do. The little jars in my spice rack in the kitchen hold small amounts so I keep a back-up of everything in my cold pantry in 1/2 cup canning jars with tight lids. I use a lot of herbs in soups and other cooking and spices in baking. I date my back-up jars and go through some of them more than once a year; others I toss when a year old and replace with fresh. I'm totally with you in believing a good supply of food NEEDS a good supply of herbs and spices! Like Mama Pea, there is a local place to me that carries lots of bulk herbs and spices, so I go there for many. I want to grow more herbs in the garden next year and am drooling over seed catalogues now. I had some marjoram growing at my last location and had put most of the plant in a zippy bag after the plant had dried. The aroma was amazing when I opened the bag, and I used it most of what was left on a pork roast. Having just had Thanksgiving here, we've been eating a lot of nutmeg and cinnamon. I do quite well for herbs and have a good range that I grow each year. I used to hang and dry the herbs but I've fell out of practice with that. the winters have been mild lately so many tend to keep growing, although I'd love to keep my Vietnamese coriander growing longer! I get most of my spices in the World or Ethnic aisles in the supermarkets. You get a great big bag for the same price as the silly little dinky jars. I decant some into jam jars and then store the rest sealed shut at the back of a dark cool cupboard they last for years. I use mostly turmeric, chilli, paprika and curry spices. I've never tried growing any spices except for Fennel, but I do grow all our own herbs. I've got sichuan peppers growing but it'll be a few years till I get anything from them!